The long 2016 season suited our McDougall Pinot well, giving our big-boned Sonoma Coast wine great balance and acidity. Juicy aromas of black cherry and dried cranberry are underlain with herbal bay leaf, spicy floral geranium, a whip of red licorice, and a dash of black tea. The density and richness of the taste to come is evident as you sink your nose into the glass to soak it all in. Candied raspberry and cherry fill your mouth at first sip, providing a solid core of structured fruit around which sandalwood, granite, and cola wrap their savory duskiness. Spicy berry crumble pie rides on firm tannins on the lengthy finish. When Mac McDougall purchased his stunning ranch spanning the Gualala River in the early 1960s he had no idea he’d ever be planting grapes on it, but in 1998 old friend Warren Dutton convinced him to do just that. 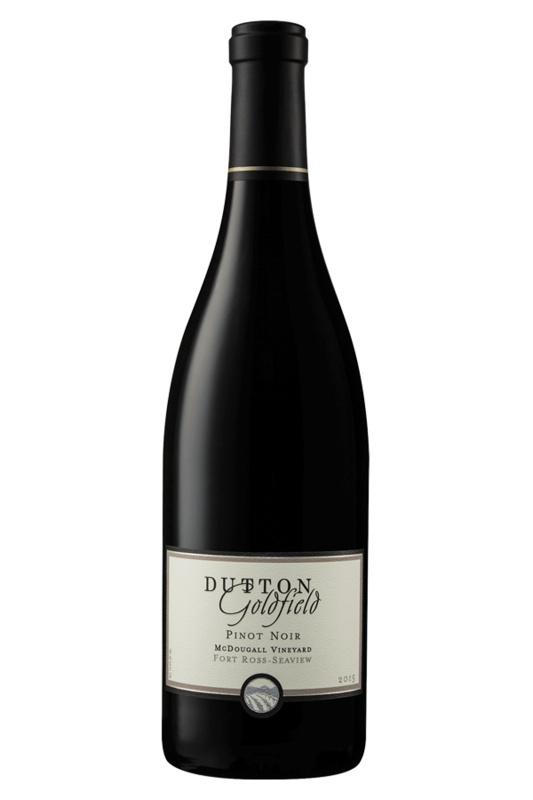 On 9 wind-protected southeast facing acres he planted 2 Dijon clones of pinot. With Mac’s sad passing, his wife Barbara and son Rich now work and stress over it. The site wraps over the ridge at about 1,100 feet and has a spectacular view of the Gualala River, the Pacific Ocean, and Mac’s neighbors at Hirsch and Martinelli vineyards. The fruit has the exceptionally thick skin, deep color and natural spice that is so characteristic of Pinot from the high slopes of the “true” Sonoma Coast. Even in this coastal region, McDougall ripens fairly early, due to its thin, well-drained soil, sheltered south slope and low yields. This same environment also imparts the minerality and solid structure for aging that this area is known for. This vineyard wonderfully represents the wild beauty and intensity of the Sonoma Coast, both in its land and its fruit. After hand sorting and destemming into small open top fermenters, the must is coldsoaked for 7 days in order to gently extract color, spice and fruit characters, while mitigating harsher tannins. To further this aim, no SO2 was used at the crusher. We punch down 1 to 3 times daily, according to the stage of the fermentation (less often at later stages to avoid harsh tannin pickup), but treat it very gently given the inherently solid structure of Sonoma Coast fruit. After fermentation, the wine is racked into French oak to age, then racked and blended in the spring of 2017 to homogenize the blend, and hone our barrel choices for final aging until bottling in March of 2018. We’ve chosen Taransaud as the signature barrel, for the way it rounds out the edges of this big bold wine. Go big with flavors to match this bold wine, like a spice-marinated butterflied leg of lamb, pancetta-wrapped roasted turkey, cave-aged gruyere or Valley Ford’s “Highway 1” Fontina style cheese.